This cleansing Spinach Apple smoothie is as delicious as it is nutritious! 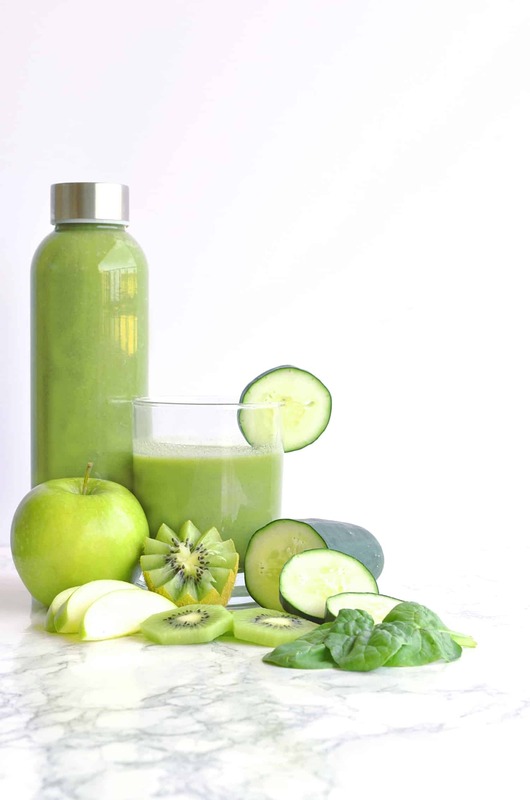 Cooling cucumber and fortifying spinach combine with tart green apple and the sweet tropical flavors of kiwi for a super refreshing green smoothie. Smoothies are generally a good choice when trying to lose weight because they are highly nutritious, filling, and low in calories. Just don’t be fooled by some of those all fruit, high-sugar smoothies out there. But spinach smoothies take weight loss to a whole new level! Spinach is a powerhouse vegetable. In addition to spinach’s powerful punch of essential vitamins and minerals, it is also very high in fiber. Fiber is extremely important for gut health but it also reduces appetite and keeps us feeling full longer! Yup, spinach really is a super veggie! That’s while you’ll find it in tons of my smoothie recipes like this anti-inflammatory turmeric smoothie or my metabolism boosting matcha smoothie. Its subtle flavor is also easily covered up by fruit – perfect for sneaking it into your kid’s smoothies! Whether you want to lose weight, boost your energy, get youthful glowing skin, or just feel great, smoothies can help you achieve your health goals! But you want to know my favorite part about smoothies? They’re just so darn easy! Simply add the ingredients to your blender, push a button, and you’re done! If you’re serious about smoothies and your health then I definitely recommend getting a high powered blender. They can blend leafy greens like spinach or kale and even small chia seeds into a silky smooth liquid! Before I upgraded to my refurbished Vitamix 5300, I was having to chew my smoothies because all the bits of greens and seeds (not to mention my smoothies were a lumpy uneven mess). Yuck! Fresh Tip: Before spending money on an expensive high powered blender, try blending your leafy greens with just your liquid ingredient first. Then add the remaining ingredients and blend until smooth. This should cut down on the green bits that you have to “chew” when drinking your smoothie! Not only will a high powered blender produce a much better professional quality texture, they’re also much longer lasting! My Vitamix blender comes with a 7-year warranty! Here’s an in-depth comparison of some of the best blenders if you’re interested in upgrading. Blendtec and some of the high performance KitchenAid blenders are also worth looking into. Smoothies are already packed with nutrition, but I like to take mine one step further and add superfood boosts! Here’s a list of my 17 favorite superfoods for smoothies that details all the different health benefits and uses of each superfood. Superfood powders and smoothies are a match made in heaven. The powders blend right in and the fruit from the smoothie covers up any undesirable tastes! It’s the perfect way to take your health to the next level! For this spinach apple smoothie I like to add moringa powder, but feel free to use any superfood boost you want! This refreshing and cleansing green smoothie is the perfect way to start your day! Sweet tropical flavors from the kiwi, apple, and banana combined with highly nutritious spinach and cucumber for a delicious and nutritious smoothie. Chia seeds add a punch of extra fiber and protein while the coconut water hydrates and replenishes electrolytes! Can’t get enough smoothies? For more smoothie love check out this Acai Smoothie Bowl! This cleansing spinach apple smoothie is sweet and refreshing but packed full of nutritious ingredients! Perfect as a slimming breakfast smoothie or a revitalizing and replenishing snack! If your blender has trouble with leafy greens like spinach, try blending just the coconut water and spinach first before adding other ingredients. If you still have to chew bits of spinach in your smoothie then you might consider an upgraded blender. I use this one and absolutely love it! Glad you liked the smoothie Sharon! I also love the energy I get from green smoothies, getting all those nutrients in first thing in the morning is the best way to start your day!